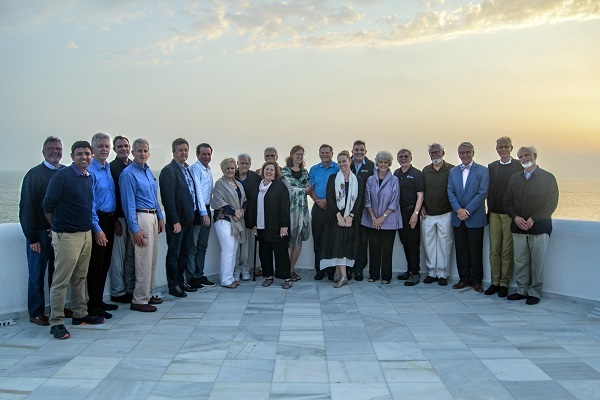 This June, Senior Associates and staff flew in from around the world to convene in beautiful Tangier, Morocco for our Annual General Meeting (AGM). The city holds deep roots to for our organization and the Magagna family. Founder John Magagna began his teaching career at the prestigious American School of Tangier (AST) where he subsequently became Head. He helped modernize the school and was a recipient of The Joseph A. McPhillips Distinguished Service Award, displayed in the front lobby of the school. The Headmaster's Prize placard presented by John and Diana Magagna, also hangs in the front lobby hallway. Search Associates maintains a strong relationship with AST and all attendees were invited by the current Head, Sarah Putnam, to tour the school. John's daughter Chief Executive Officer Jessica Magagna was born in Tangier and feels a deep love for the culture and community. This city was the perfect place for Search Associates to honor John and the lives he has impacted through his work, as he officially announced his retirement. It also served as an ideal backdrop for the transition to Jessica’s leadership of the organization as it moves into another era of growth and success. Learn more about our exciting plans for the future!